St. Louis, Missouri is a city where local organizing is creating a vibrant and burgeoning new economy. 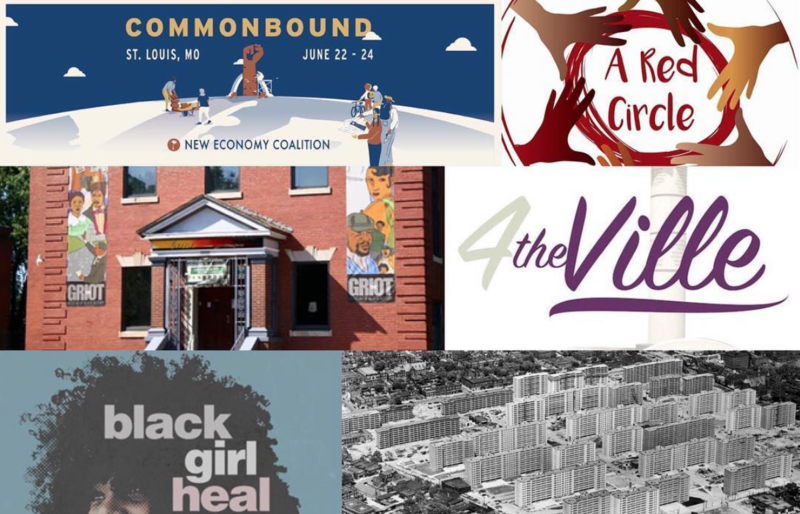 NEC is thrilled to partner with Solidarity Economy St. Louis, a network of St. Louis organizations and individuals, to plan CommonBound and ensure it both adds fuel to local organizers’ efforts and grounds visitors in the critical work happening there. They have put together incredible site visits for CommonBound attendees to get to know the city deeper from a historical, social and cultural point of view. Take a look below and register today! Site visits will occur Friday, June 22 from 1 - 5 pm and Saturday, June 23 from 4 - 7 pm. We will provide shuttle transportation for all site visits the depart and return to Harris-Stowe State University. Tickets are $20 and are limited. Sales for the site visits end on June 16th! This tour will be led by St. Louis native, Bob Hansman, associate professor and a faculty fellow of the Gephardt Institute for Civic and Community Engagement at Washington University in St. Louis. 50% of ticket sales for this site visit will support City Faces and the Jermaine Lamond Roberts Memorial Studio. The United States is sprinkled with African-American communities that have endured segregation and discriminatory practices to become historical monuments of African-American culture. While we are familiar with popular names such as Harlem and Black Wallstreet, a lot of these communities still go unknown. St. Louis is home to one of those great cultural relics, the Ville. During the past century, the Ville stood as the cultural and academic epicenter of black St. Louis serving as home to internationally recognized institutions, educators, business and artists. Though the disparage of discriminatory practices have weighed heavily on the sustenance of the neighborhood, its greatest landmarks still remain reminding us of the legacy of the Ville. Tour hosted by 4TheVille. The Black Girl Heal experience is a sacred space filled with dance, poetry and healing circles. Black Girl Heal will include a wide variety of mediators, activities, and tools to assist you on your journey to mastering self and obtaining balance. Our goal is that you would leave refreshed and equipped with practical and effective methods to continue healing. Please note: You must identify as a black woman to register for this site visit. 50% of ticket sales for this site visit will directly support Black Girl Heal. The Griot uses life-size wax figures, other art, artifacts, and memorabilia to interpret the stories of African Americans with a regional connection who have contributed to our country’s development. Visitors can “meet” and learn about Carter G. Woodson, Josephine Baker, Dred and Harriet Scott, Elizabeth Keckley, William Wells Brown, James Milton Turner, Clark Terry, Dr. Martin Luther King Jr., the Rev. Earl. E. Nance Sr., Miles Davis, Madame C.J. Walker, York, Percy Green, Macler Shepard, Chief Sherman George, and others. The Griot's interpretative program includes an authentic slave cabin, originally built on the Wright–Smith Plantation in Jonesburg, Missouri. Although St. Louis County is the second highest income-producing region in Missouri, economic disparity still exists within North County, which includes the Ferguson municipality. This tour will include a firsthand look at suburban decay and sprawl within North County and the many ways the local community is working on regional improvement and economic development. Plus get your hands dirty with some work at a local market. It will be led by A Red Circle, an organization working to achieve racial equity, increase healthy food access, and promote economic activity within the north St. Louis County communities.